Rogue One opens in a short 198 days (omg omg omg) but between now and then, the cast and crew has to return back to that galaxy far, far away. According to multiple sources, the next installment of the Star Wars saga — and one that will work as a stand-alone story — is scheduled to head back into production this summer for roughly four weeks. Going back to do reshoots on a movie is not totally uncommon, and happens more often than you realize. It happens all the time. But when it happens to a Star Wars movie it’s kind of a BIG DEAL. There’s also the REALLY COOL RUMOR that these reshoots were always planned to add in — omg — Young Han Solo. Alden Ehrenreich was cast in the role only a month ago, well after filming on Rogue One ended. These reshoots might simply be to accommodate him, and YES. It’s also thought that these reshoots are to add a little more fun and lightheartedness into a movie that is really about a bigger plan to eventually blow up a giant military base. This same thing happened to Warner Bros. Suicide Squad not that long ago, where the whole cast was gathered back together to shoot a few more scenes to add in a few more jokes (not the part about blowing up the Death Star, that’s just Star Wars). 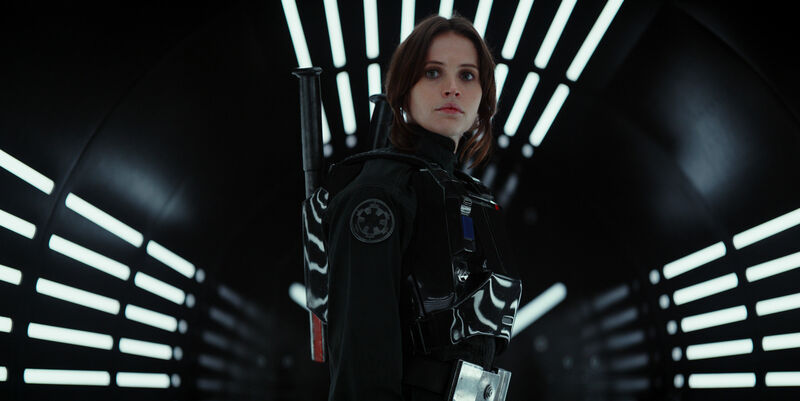 Whatever’s going on behind the scenes with Rogue One, we’re still here for it. At the end of the day, it’s still another Star Wars movie, and it’s a female-driven Star Wars movie, and we can never have enough of those.